The FT290R2 is a great 144MHz rig as an IF for portable microwave work, featuring all-mode, battery or external 12V operation and easily handled output power. 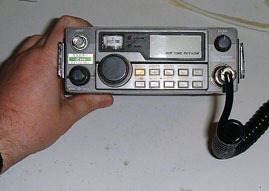 However, unlike the Mk1, the R2 does not present +12volts on transmit at the antenna socket for the automatic switching of external linear amplifiers or transverters. It is easy to modify the R2 to restore this most useful facility. Basically, all that is needed is to make a high impedance connection between the antenna socket and a point within the transceiver's circuit where +12 volts is present on transmit. It is essential that a high impedance connection is made to ensure isolation between the rf output and the high current capability of the transceivers battery supply. 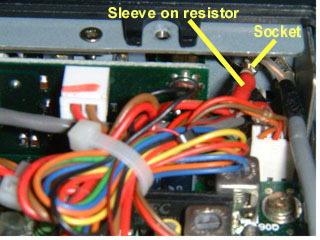 This is accomplished by using a high value resistor directly at the output socket as shown. First, remove the battery box and/or dc supply lead. 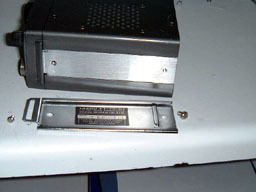 Next, remove the two screws holding each of the side plates (4 screws in total). These screws seem to be Posidrive. Next, remove the four screws holding the top cover in place (the one with the loudspeaker grill). Carefully lift the cover ensuring the speaker lead is not broken. Unplug the speaker lead from the socket on the right hand side (viewed from the front) and place the cover safely on one side. Locate the small PCB at the rear of the unit, next to the phono socket. At the phone socket side you will see three pads with an orange lead soldered to the top one, red to the middle, and brown to the lower one. The orange one may have a small ferrite bead slipped over it. The pad you want is the middle one with the red wire. The pad is marked 'RLY TXB'. Select a fine red wire about 6 inches long (150cm). 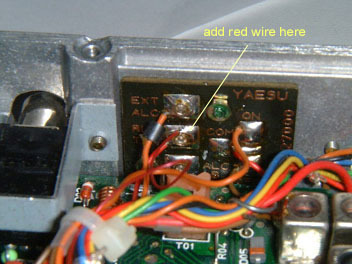 I used a piece of wire wrap, but a better choice might be to to use the red wire from an old PC mouse lead. It is often possible to find such leads in computer scrap boxes at radio and computer rallies/fairs/swapmeets etc. These leads are a fine source of multcolour, multistrand wire. Solder one end of the lead to the pad. Lace the wire through the cable form to emerge near the BNC antenna socket. Slip a piece of insulated cable sleeve ove the wire. Cut the leads of a 4k7 to 8k2 1/4 watt resistor to about 1mm long. Solder to the end of the wire and slip the sleeving over the joint. The sleeve should be about 15mm long. Carefully solder the other end of the resistor to the centre spill of the BNC connector, avoiding de-soldering the existing coaxial cable inner that should remain connected. Don't use too much heat and melt the coax or it might short to the braid and cause an expensive PA failure when you next try to transmit. The resistor MUST be at the BNC socket end of the lead, as it acts as a choke to prevent rf getting back into the supply via the new lead. It must also have short leads! The mod will not affect normal operation of the rig. The resistor will ensure only a few mA will flow from the antenna socket into any short circuit you might inadvertently apply to the output. In practice, my FT290 works well with the DB6NT 24GHz and 5.7GHz transverters and also works well with my home brew 3.4GHz transverter that uses a variation on the OE9PMJ switching circuit. It should work with any transverter requiring at least 2V +ve at high impedance to switch it to transmit. The available voltage is dependant on the resistor value in the transverter. 2V is purely indicative.